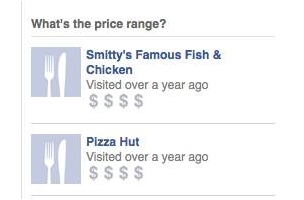 Facebook Asking Users To Rate Restaurant Prices? Facebook’s five-star ratings system appears to have been joined by four-dollar-sign price ratings for restaurants. 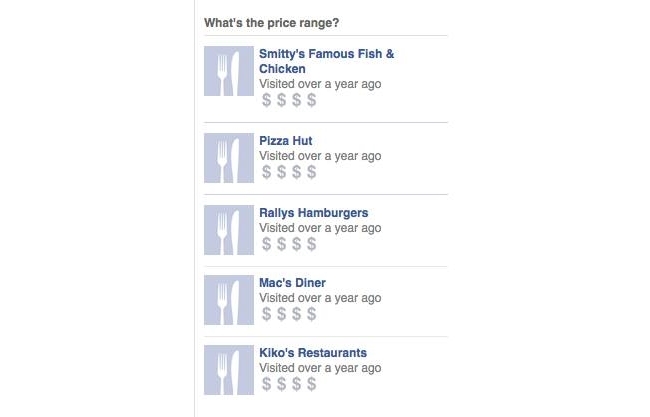 Reader Dylan C. Douglas shared the screenshot above with AllFacebook, in which it appears that users are being asked to rate the prices of restaurants, with one dollar sign representing the cheapest and four dollar signs the most expensive. Readers: Have you seen this yet?